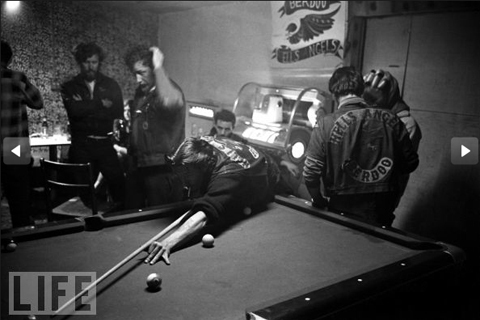 We used to hang out in a Hells Angels bar, the Canby Sweet. Van Nuys chapter. This was back in the 80’s, there was a record store around the corner that would book all kinds of cool shows. We’d smoke pot in someone’s van parked out front, coughing and giggling, but if ya wanted a beer you had to go into the Angels hang around the corner. We always wanted a beer. The dudes were mellow, huge and almost laid back. 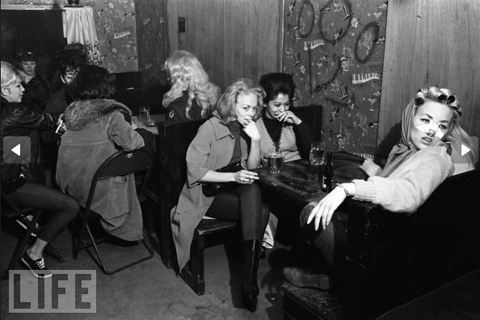 The women were insane, tight jeans, tighter tees and violent tempers. Hot, scary hot. I really liked the place. We never got in anybody’s way, and they tolerated us just fine. Only time it ever got a little tense was when the women were tweeking. At the pool table they’d wave the cues around wildly, and they’d slam their empties on the bar and demand another. They always got served immediately. It was never fast enough for them. They’d grab the fresh beer off the bar and chug a lug, yell something at somebody, and stride across the room, their asses like sculpted marble. This entry was posted in Story telling and tagged Be Bop Records, Hell's Angels. Bookmark the permalink.